In a special study posted late last month, The Economist suggested that we are on the verge of a third industrial revolution. The first, the development of the urban mill in late 18th Century England, and the second, the development of the assembly line in early 20th Century Detroit, both served to centralize production facilities and enable the production of a single type of good in mass quantities. 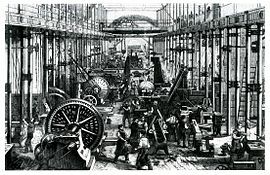 This third industrial revolution, the study notes, dissolves the need for centralized production facilities at all. In fact, it does away with what we know as production facilities altogether. This third revolution is driven by the global data networking potential of the Internet and a series of machines that facilitate the production of standard and custom parts and products almost anywhere in the world at any time. And it's also driven by the underlying mentality behind this technology, that not only is hyper-local custom production possible, it's better. So, obviously, the main question is "How do I/does my company take advantage of this?" And there are several answers. A lot of this technology and localized production talk stems from the rapid advancements in the 3D printing space and prototyping space. If your organization is looking into implementing this, know that these products are not all the same. Some can work with metal, some can only work with specific plastics or acrylics. It's important to understand these products are still limited by their cost and production yields. Their value comes in their customization and their on-demand production capabilities, so while they can't save money in the production of one million identical shovel heads (yet), their rapid prototyping and on-demand value is immense to specialty manufacturers, who can make design changes on the fly without worrying about stale inventory. Outside the 3D printing and fabricating space, material advancements may lessen your organization's reliance on indexed commodities. For instance, substances with the strength of steel fabricated from sustainable natural elements, and batteries reliant on easily replicated viruses are being developed for market as you read this. Take a lesson from Apple. When they were developing the iPhone, the company, under the guidance of CPO Tim Cook, secured virtually all capacitive touchscreen and flash memory technologies as they ramped up production, allowing the company to meet the massive demands for the new product while also locking out any potential competitors from capitalizing on the technology for a time. As you review the new technologies, audit and analyze your own production processes and capabilities. Know what advancements would give you a competitive edge and lock them down. This is likely the biggest one, and the hardest to do. Much like the automobile put stables out of business, and how the Internet rendered the music and movie industries irrelevant, these technologies have the potential to revolutionize industry (hence the Economist's premise). Like every advancement before it, this will help some and hurt others. The MRO potential is tremendous, offering a seemingly endless stream of replacement parts for products without OEM support due to "planned obsolescence. Your company's equipment purchasing and maintenance strategies forever changed. On the flip side, if you're in the production business for these parts and components, or a manufacturer reliant on the boost that planned obsolescence provides, you may find yourself repositioning your abilities out of manufacturing and into intelligence and information. The ability to produce specialized components for a manufacturer - say, laptop chassis for Dell - will no longer be marketable if the company can produce the same via a bank of in-house automated machines as they're needed. Shipping and logistics providers will need to adjust to the altered workload, as hyper-local production could eliminate the need for long-distance deliveries. In this entire discussion, one thing that is important to remember is that this is a burgeoning technology. It could feasibly become the future of industry, as it's being heralded by the Economist, or it could just as easily go the way of dummy terminals and fax machines. We don't know yet. What's your take?